Editors: Levin, Simon A., Carpenter, Stephen R. and Godfray, H. Charles J. The Princeton Guide to Ecology is a concise, authoritative one-volume reference to the field's major subjects and key concepts. 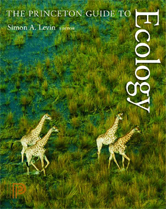 Edited by eminent ecologist Simon Levin, with contributions from an international team of leading ecologists, the book contains more than ninety clear, accurate, and up-to-date articles on the most important topics within seven major areas: autecology, population ecology, communities and ecosystems, landscapes and the biosphere, conservation biology, ecosystem services, and biosphere management. Complete with a glossary of key terms and suggestions for further reading on each topic, this is an essential volume for undergraduate and graduate students, research ecologists, scientists in related fields, policymakers, and anyone else with a serious interest in ecology.